SEBRING, Fla. - A Sarasota man attended the Sebring U.S. Sport Aviation Expo at the Sebring Regional Airport on Jan. 21 looking for a sponsor for his project plan to become a flight instructor to the deaf. On Dec. 31, Gregory H. Lawrence (pictured), 61, who has been deaf since he was a baby, scored a 90 on the FAA Certified Flight Instructor Knowledge test. "All that's left is the flying," he said. "That's the easy part." Lawrence said he has been flying as a licensed pilot since 1966. He passed the written part of his test for a commercial pilot license, but couldn't go any further due to physical limitations. So he educated himself on Light Sport Aircraft. 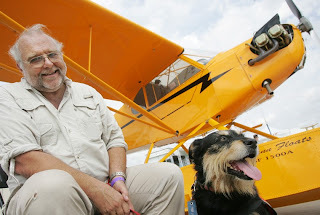 "If you're healthy enough to drive a car and have a driver's license, in most cases you can fly a Light Sport Aircraft," he said. He and his hearing dog, Jenny, walked the grounds Thursday. Jenny appears to be part Airedale and was popular among the folks in the Hospitality Tent. Jenny is trained to alert him to a door bell or knock, or an alarm and sometimes sudden noises. She spent much of her day Thursday sniffing out the sources of barbecue that hung in the air from local vendors and tidying up the grounds after people ate. Lawrence said he lost his hearing after streptomycin was administered to him as an infant. They have since learned the drug can lead to "ototoxicity," which can destroy auditory nerves. Once he passes the Practical Test, deaf people will be able to learn to fly from another deaf person for the first time ever, said Lawrence. Lawrence said he plans to tour deaf schools and clubs across the country, as well as regular schools, telling his story and making his presentation in hopes of inspiring other hearing-impaired people to learn to fly. "It was not possible for me to be a flight instructor for many years because of government regulation," said Lawrence. "The government allowed the Light Sport Aircraft industry to regulate itself and it is now possible for me to be a sport pilot certified flight instructor." There are 13,505 airports in the United States and only about 700 of them have control towers that require radio communications, said Lawrence. "The rest of them deaf people can fly into." That's the basis for his business plan. "William T. Piper built his company going around the country teaching people they can fly," said Lawrence, "and promoting air parks; and by-the-way selling them the aircraft to keep his company going during the depression." He's waiting for the day that pilots will be able to communicate with air traffic controllers in writing. "We (deaf people) can text somebody in Japan but not the FAA Air Traffic Control system," said Lawrence. "That will change some day. The hearing pilots need to be able to scroll back and see what the instructions were." Light sport was developed to make flying available to the public, said Lawrence. "The greatest challenge for an instructor is to help the student realize his or her potentialities for continued development," said Lawrence.